Some users have noticed that we have the beginnings of support for groups in Google Wave, so we figured we'd give everyone a quick explanation of how it currently works. Keep in mind that this is in the very early stages and we have much better functionality planned for the future, but feel free to try it out! 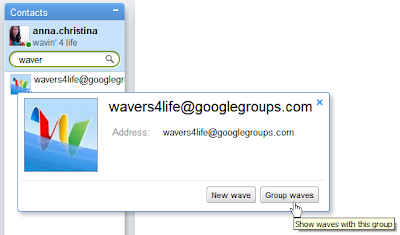 Currently, you can add a Google Group to a wave, set permissions and then view and edit waves with that group. Unlike other group conversations, however, group waves will only show up in Google Wave, not in the Google Groups interface. When creating a group, note that most of the settings of Google Groups are respected; for instance, if the group is set to allow anyone to view content, anyone may view that wave. 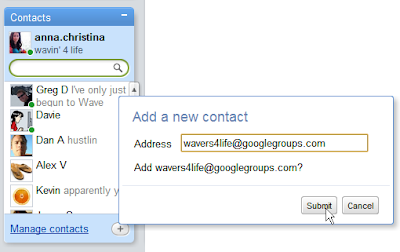 You will have to add Google Wave users into your group with their username@gmail.com address (we're in the process of getting username@googlewave.com working, too). Under the 'Appearance' setting, chose an image that will help you identify your group in Google Wave. Learn more about how groups settings work with Google Wave. If you already have a Google Group, you're ready to go. Click the '+' button in the lower right corner of the contacts panel, type in the name of the group (including @googlegroups.com) and hit 'Submit'. You can do this either by clicking on the group's contact and then on the "Group Waves" button or by searching for "group:groupname@googlegroups.com". If you'd like to create a quick shortcut to get to these, try saving your search! Find information on more group searches in our Help Center. We recently launched the ability to follow waves. You will not be automatically following group waves, so use the follow feature to make them appear in your inbox when they're updated. This is just the beginning for groups. In the future, you'll have a groups option in your Navigation panel that will help you find and follow group waves. We'd love to hear your thoughts, let us know what you think on our Help Forum.